Abstract: In this paper we focus on corpus-linguistic studies that address theoretical questions and on computational linguistic work on corpus annotation that makes corpora useful for linguistic analysis. First we discuss why the corpus linguistic approach was discredited by generative linguists in the second half of the 20th century, how it made a comeback through advances in computing and was finally adopted by usage-based linguistics at the beginning of the 21st century. Then we move on to an overview of necessary and common annotation layers and the issues that are encountered when performing automatic annotation, with special emphasis on Slavic languages. Finally we survey the types of research requiring corpora that Slavic linguists are involved in worldwide, and the resources they have at their disposal. Abstract: This article discusses major research areas in Slavic generative syntax. It begins with a short survey of topics, identifying important literature and useful resources. It then examines selected areas in more detail, specifically: (i) multiple wh-movement, (ii) secondary predication and control, (iii) agreement and coordination, and (iv) nominal structure and phases. Finally, several domains of inquiry are singled out for future research. Abstract: This paper explores the connection between Slavic languages and the theoretical tenets of construction grammar, a cognitively and functionally oriented approach to linguistic analysis. The strengths of traditional Slavic linguistics consist particularly in its focus on diachronic concerns, lexical semantics, and on issues of morphology. Constructional analysis provides a rm theoretical grounding for these traditional areas and also draws attention to phenomena and issues that have been less prominently pursued by Slavic linguists. This concerns various kinds of syntactic patterning but also the domain of discourse organization and grammatical devices that serve speci c discourse functions, be it the nature of pragmatic particles, specific clausal structures, expressions of subjective epistemic stance, etc. Of interest is also the origin and evolution of such devices. This area has been generally left just about untouched in Slavic linguistics, yet it represents an enormous pool of interesting data and relates directly to theoretical questions that are presently in the forefront of general linguistic research. With respect to the evolutionary perspective, the present paper also comments on the role of pragmaticization and constructionalization and their manifestations in particular instances, including suggestions for how they can be conceptualized with the contribution of construction grammar. Abstract: This review discusses a number of recent studies focusing on the role of phonological and morphological structure in lexical access of Russian words by non- native speakers. This research suggests that late second language (L2) learners differ from native speakers of Russian in several ways: Lower-profciency L2 learners rely on unfaithful, or fuzzy, phonological representations of words, which are caused either by problems with encoding difficult phonological contrasts, such as hard and soft consonants, or by uncertainty about the phonological form and form-meaning mappings for low-frequency words. In processing morphologically complex inflected words, L2 learners rely on decomposition to access the lexical meaning through the stem and may ignore the information carried by the inflection. The reviewed findings have broader implications for the understanding of nonnative word recognition, and the role of L2 proficiency in lexical processing. Abstract: The last 25 years in Slavic dialectology mark the period not only of JSL’s founding but also of major and multiple political, social, and economic reorganizations in predominantly Slavic-speaking states. During this period research institutions and their priorities and projects have both continued and changed; technological innovation has meant moving towards electronic dissemination, “digital humanities,” and innovative modes of presenting research data and findings. In some cases major works (e.g., dialect atlases) have advanced during this period. Moreover, a new generation of scholars has had greater opportunities for mobility and therefore exposure to a variety of linguistic frameworks and approaches, which has fostered cross-border collaboration in the eld. The present essay gives an overview of progress made on dialect projects both created institutionally and individually and including both traditional (book, article) and new digital means of dissemination. Abstract: This paper provides an overview of recent work on the first language acquisi- tion of Slavic languages. The focus is on those areas in which the most work has been done since the year 2000: referring expressions, nominal inflection, the verbal domain, and word order, with a brief mention of other topics, including the acquisition of phonology. Most of the studies reviewed here focus on typical monolingual first language development, but bilingual first language development is discussed where relevant. Abstract: We outline some recent highlights in the application of cognitive linguistic theoretical and methodological approaches to the analysis of Slavic languages. A principal strength of cognitive linguistics is the way it focuses our attention on the continuous nature of linguistic phenomena. Rather than positing rigid categories and strict definitions, cognitive linguistics addresses the messy realities of language, facilitating the extraction of coherent patterns from the noise of human communication. We fol- low a thematic arrangement motivated by the types of variation we observe in language and the analyses proposed by Slavic linguists. These include variation across meaning and form, across modalities and genres, and across time and speakers. Abstract: This article presents an overview of the last two decades of research in synchronic Slavic theoretical phonology and the elds it interacts with, such as phonetics, morphology, and syntax. The overview is arranged around the properties of Slavic languages that prominently figure in the recent discussion of theoretical phonology. It concentrates on the specific phenomena in Slavic, such as vowel reduction, vowel/ zero alternations, stress and pitch accent, vowel coalescence, voicing assimilation, wordnal devoicing, and consonant clusters and syllabi cation, and on how these phenomena are relevant to phonological theory and Slavic linguistics. Abstract: This article provides a general overview of research in Slavic sociolinguistics after 1989, focusing particularly on the most recent work (2010–16). Trends in sociolinguistic research in the East, West, and South Slavic areas are discussed, and in the conclusion the article considers perspectives for future research. Abstract: In this overview article, I seek to identify and discuss some tendencies in Slavic historical linguistics in recent years. Rather than presenting an extensive catalogue of studies on miscellaneous topics, I focus on three general issues, viz., how Slavic historical linguistics is developing in response to new theoretical ideas, methodological innovation, and “new” data. 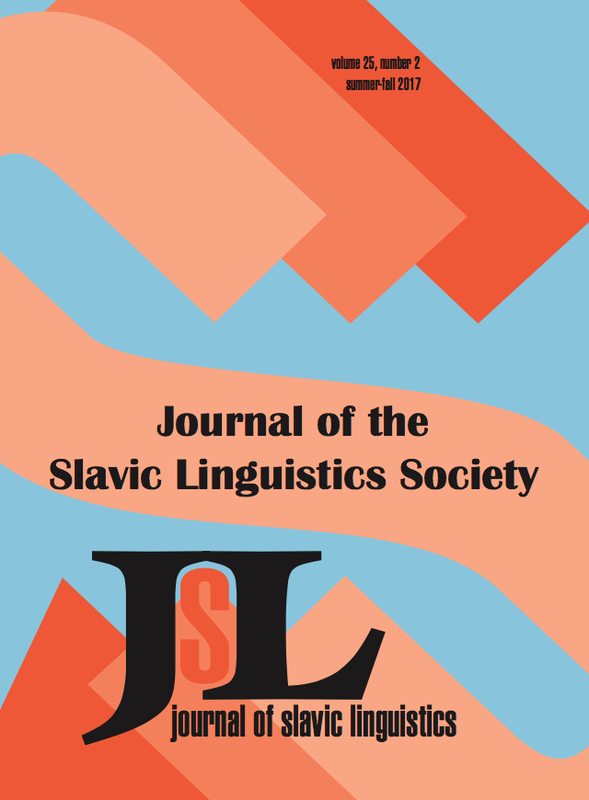 The article explores case studies from the syntax, morphology, and phonology of a number of Slavic languages and tells eight stories about Slavic historical linguistics in the 21st century. Abstract: This article provides an update on research in Slavic psycholinguistics since 2000 following my first review (Sekerina 2006), published as a position paper for the workshop The Future of Slavic Linguistics in America (SLING2K). The focus remains on formal experimental psycholinguistics understood in the narrow sense, i.e., experimental studies conducted with monolingual healthy adults. I review five dimensions characteristic of Slavic psycholinguistics—populations, methods, domains, theoretical approaches, and specifc languages—and summarize the experimental data from Slavic languages published in general non-Slavic psycholinguistic journals and proceedings from the leading two conferences on Slavic linguistics, FASL and FDSL, since 2000. I argue that the current research trends in Slavic psycholinguistics are (1) a shift from adult monolingual participants to special population groups, such as children, people with aphasia, and bilingual learners, (2) a continuing move in the direction of cognitive neuroscience, with more emphasis on online experimental techniques, such as eye-tracking and neuroimaging, and (3) a focus on Slavic-specific phenomena that contribute to the ongoing debates in general psycholinguistics. The current infrastructural trends are (1) development of psycholinguistic databases and resources for Slavic languages and (2) a rise of psycholinguistic research conducted in Eastern European countries and disseminated in Slavic languages. Abstract: This state-of-the- eld article traces some recent trajectories of morphological theory, illustrated via four classic problems of Slavic morphology: vowel-zero alter- nation, stem consonant mutations, paradigmatic gaps, and animacy-determined accusative syncretism. Using Russian as the primary illustrating data, one theme that emerges is that theories that leverage the distributional properties of the lexicon have made progress against previously intractable aspects of these phenomena, including idiosyncratic lexical distributions, unexpected (non)productivity, and distributions shared by distinct exponents. In turn, the analyses raise new questions.